Origin: Delta Quadrant. A cybernetic life-form thousands of years old which is part organic, part artificial life. They have advanced well beyond Federation science, unknown prior to a confrontation with the U.S.S. Enterprise NCC-1701-D arranged by the entity known as "Q" circa stardate 42761 ( 2365) some 7,000 light-years past explored Federation space in the Delta Quadrant. The Borg have a singular goal, namely the consumption of technology, rather than wealth or political expansion as most species seek. 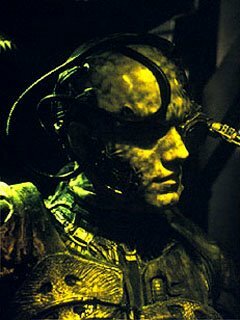 According to their spokesman, in the form of an assimilated Captain Jean-Luc Picard, the Borg only want to "raise the quality of life" of the species they "assimilate." Androids, for example, they view as primitive and obsolete. Born humanoid, they are almost immediately implanted with bio-chips that link their brains to a collective consciousness via a unique subspace frequency emitted by each drone. This collective consciousness is experienced by the Borg as "thousands" of voices — they are collectively aware, but not aware of themselves as separate individuals. Consequently, they never speak in singular pronouns, referring to themselves when required as merely "Third of Five," for instance. The Borg ingest only energy to drive their technological system via an energy conduit port. Their bio-chips synthesize any organic nutrients needed. Among the many advantages their collective consciousness affords them, the Borg hive-mind allows for instantaneous adaptations to shield and phaser frequency modulations in combat; they are also able to regenerate and repair their massive cube ship with the power of their collective thoughts alone. The hive-mind drones do not register as individual life-signs when scanned, only as a mass reading and then at a bare minimum. The sick and injured are not healed but "reabsorbed" by the removal of the receiver piece, which leads to self-destructive dissolve. When shipboard during dormancy in their regenerative mode, power is minimal and the vessel's EM field cuts off. They have a knock-out drug or procedure for humans, using a drill-tap placed behind the left ear, that works immediately but wears off in less than a minute. "We are the Borg. Lower your shileds and surrender your vessel. Existence as you know it, is over. we will add your biological and technological distinctiveness to our own. Your culture will adapt to service ours. RESISTANCE IS FUTILE!" I watched Blade Trinity last night, despite the protests blurted by most of my friends about how bad the movie is. But I didn't care. No matter how bad the movie REALLY is, I know I'd still enjoy every minute of it. Why, you ask? Well because it is of VAMPIRES, my all time fascination which I've been always drawn into. Like a moth to a flame.. I don't quite remember when was the first time the fascination began. And I don't know why. I remembered as a small child, watching Nosferatu, I was terrified beyond belief I remembered having sleeping disorders few nights after watching it. I swore that time that I would never watch vampire movies anymore. But to reasons I could never explain, I ended up watching more and more vampire movies.. Dracula 1982, Fright Night (which was VERY scary!! ), The Lost Boys. And then in the 90s, came the jawdropping Bram Stoker's Dracula by Francis Ford Coppola. It was after this particular movie, my fascination ran irrepressibly amok. Gary Oldman was brilliant! And then came Innocent Blood, Buffy the Vampire Slayer, Stephen King's Sleepwalker, I devoured it all, as if feeling their very thirst, I tried my best to get all vampire movies within my reach. Then I heard of Anne Rice. This lady writer writes chronicles about vampires, they say. So I began the hunt for the first book, Interview with the Vampire. Not very easy at that time, for imported books were rarely found and cost dearly. But I managed to find the book and read it like crazy. Eyes weary and red, but I kept on turning the pages.. More and more fascinated by the turn of each page. What I was (and still am) so fond of Rice's vampires (especially Louis de Pointe du Lac and Claudia) is because instead of being horrific, they're sorrowful, lonely and in their own way, look somewhat humane, despite the immortality and superiority they have over mere mortals.. Ah.. Beautiful. Anne Rice, whose vampire trilogy heated up the current craze, began her fascination with vampires very young. "My first encounter with vampires was seeing the movie Dracula's Daughter," she says. "I loved the tragic figure of the daughter as a regretful creature who didn't want to kill but was driven to it. "When I was a child we had a story from the library called 'The White Silk Dress.' A child vampire told the story in the first person, and I thought it was quite wonderful. I was 8 or 9 years old and I never forgot it. I wanted to get into that vampire. That was the interesting point of view to me - the people right in the center of it all." 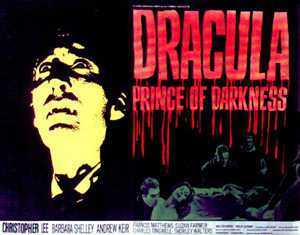 Unlike nearly all earlier writers, Rice has never seen vampires as fully monstrous creatures. "Vampires are tragic; they are not pure evil. They have a conscience, they suffer loneliness. "The vampire is a cerebral image that transcends gender. I always saw them as romantic and abstract. In Bram Stoker's Dracula, they're presented as close to animals, but I always saw them as angels going in another direction….finely tuned imitations of human beings imbued with this evil spirit. "The challenge of writing a vampire novel in the 20th century," Rice reflects, "is to write one that's fun about creatures of the night, yet still bring them into some sort of philosophical context that satisfies me. "I didn't think about creating a credible vampire mind, I just did it. It was a challenge to take people who were supposed to be thousands of years old and imbue them with wisdom, and try to imagine what their shortcomings would be." Could she see herself as a vampire? "If I were a vampire I would like to be Lestat," Rice says. "What fascinates me is that he knows right from wrong and he still does what he has to do. He's determined to be good at being bad." The BEST love song ever..